A week of afternoon downpours helped to ease my craving for summer T-storms, but probably wasn’t much help to the fish, I thought, as I looked out over the muddy Truckee on Wednesday evening. 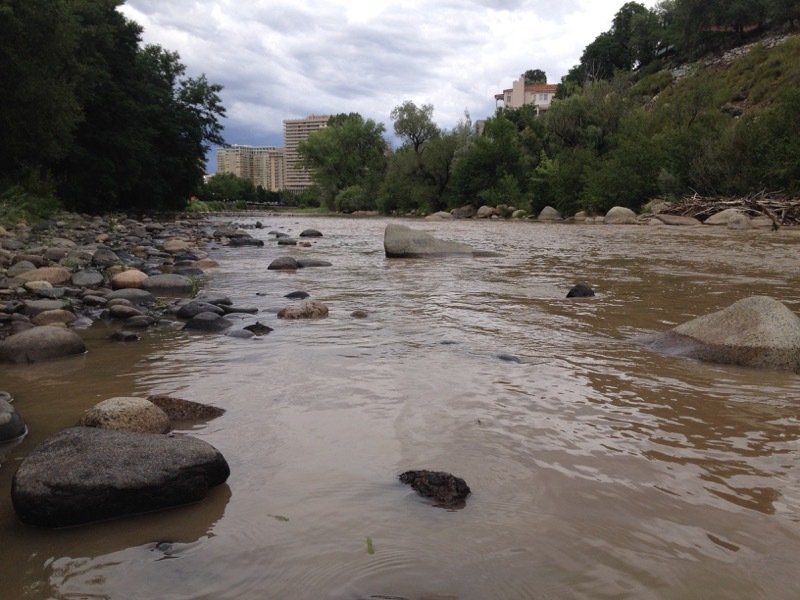 The river was flowing high, and it was the color of slightly yellowed chocolate milk. (yum). The ducks didn’t seem to mind, but what about the fish, I wondered? How are drought-stressed fish able to breathe through all of the mud and sediment that washes downstream when it rains? The muddier the water is, the harder it is for a fish to survive. The longer the water stays muddy, the harder it is for a fish to survive. 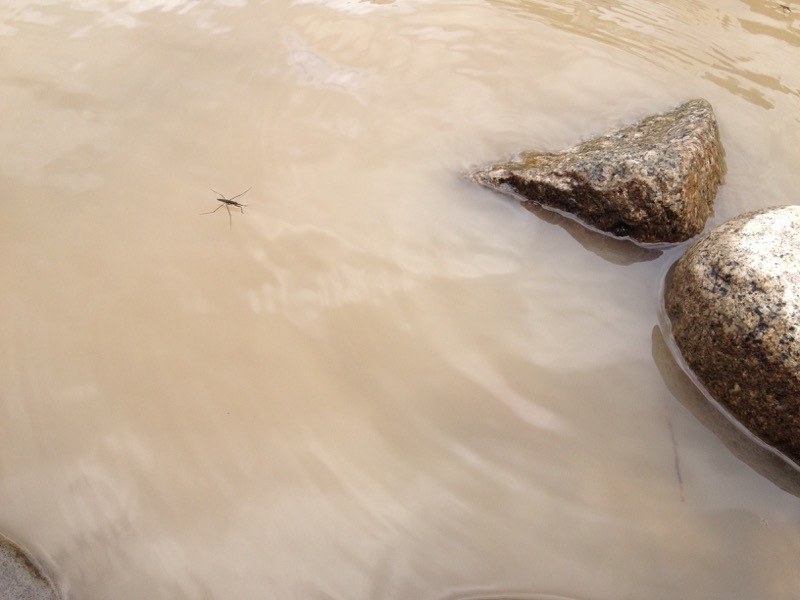 A water strider on the Truckee River, July 8, 2015. Although the storms caused the water level in the Truckee to rise, and the water was pretty muddy, the high flows were short-lived, and the water looked quite a bit clearer by Thursday night. Here’s a graph that shows the flow of the Truckee River over the past month, at the Reno stream gauge. As you can see from the three spikes on the right side of the graph, the storm temporarily raised the water level back up to the line of orange triangles, which marks the “average” level of flow this time of year. Unfortunately for the fish, the higher flows didn’t really stick around. Even though we’ve had a lot of rain, we’re still in a drought — and NDOW and many local fisherman are asking people to “Rest your River”, which means to avoid fishing during the heat of the day. They are encouraging people to fish before 11am, and when water temperatures are below 68oF. 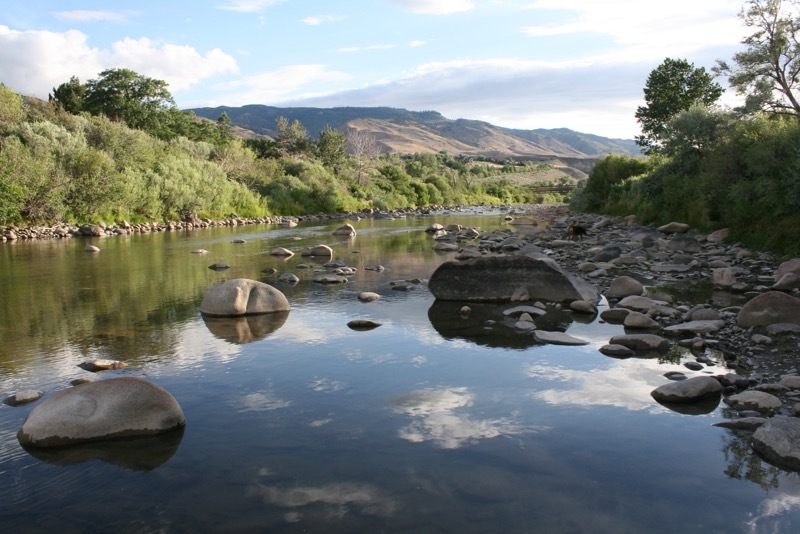 Warm water holds less oxygen, so when water levels in the river are low and water is warm, the fish are already pretty stressed. By Thursday night, the water level looked lower, and more clear. As an alternative to fishing, it’s pretty easy to see fish gathered together in the deep pools when the river is low. Take a picture, and send it to Truckee River Guide! Looking downstream toward downtown Reno, July 8, 2015. 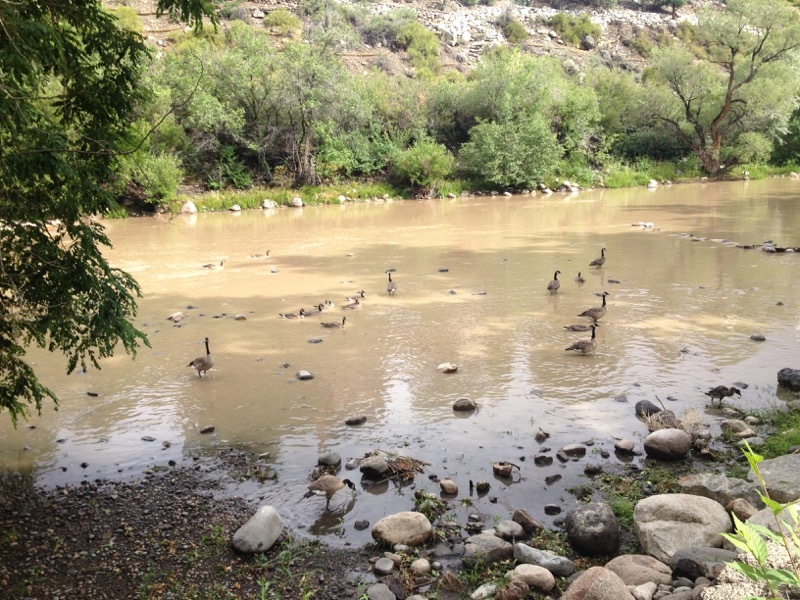 Canada geese in the Truckee River, Reno. July 8, 2015. A duck. 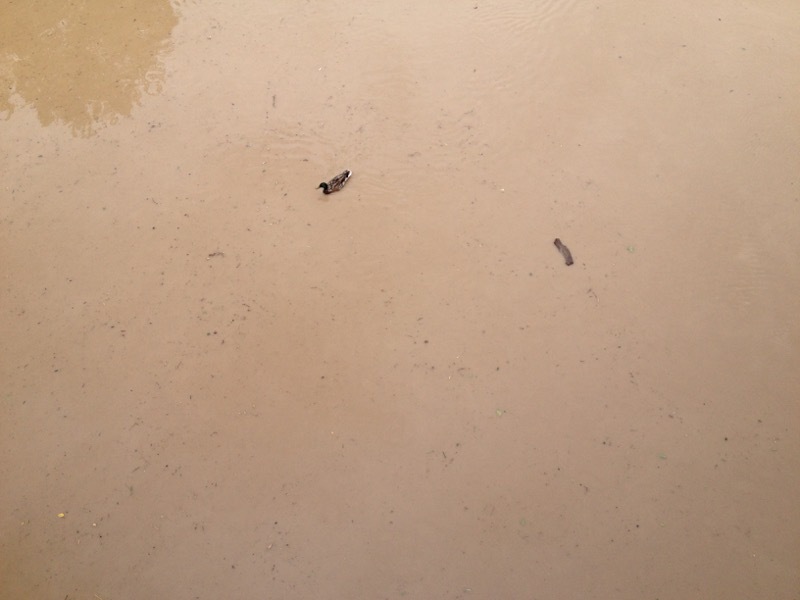 Maybe there’s a fish down there too…July 8, 2015. By Thursday evening, things were looking up. Dorostkar Park, July 9, 2015. I’ve wondered about this many times and never researched it. Thanks!